A new study theorizes that dinosaurs would have eventually killed themselves off by eating poisonous substances and not knowing how to avoid them. 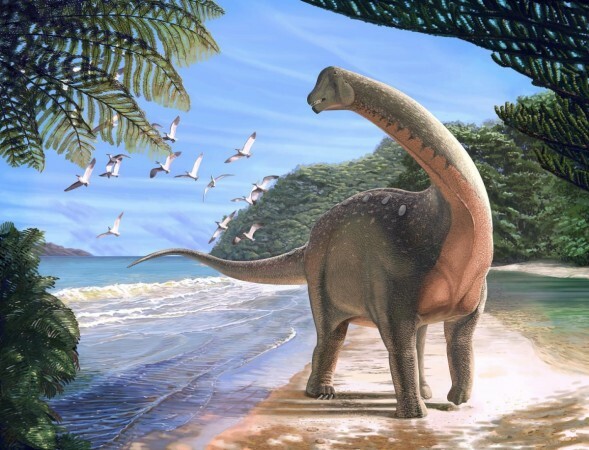 Dinosaur numbers were already on a downward spiral by the time the killer asteroid that rendered them extinct hit Earth, and it is likely that they would have probably died out because they did not evolve a "taste aversion" to poisonous plants and fruits. A new study theorizes that given how the first flowering plants on Earth were poisonous and have shown up in fossil records around the world, it is highly likely that the dinosaurs consumed poison without they knowing what they were eating. Also, dinosaurs did not evolve the sense of smell or taste to tell which plants were safe to eat. This study was published in the journal Ideas in Ecology, reported Inquisitr. Researchers have found poisonous plants and flowers inside dinosaurs from well before the asteroid hit Earth 66 million years ago, marking the end of the Cretaceous Period. In fact, the scientists claimed dinosaurs were so heavily impacted by their inability to distinguish safe plants from poisonous ones that their numbers showed an actual decline. In comparison, present-day animals like rats, notes the report, can ingest a small quantity of food and tell right away if it will make them sick using just their senses of taste and smell. Animals have developed an innate ability to tell which foodstuffs are not good for them and they actively avoid eating them. Dinosaurs, on the other hand, have been found to almost hasten their own extinction to continually eat and digest poisons that were obviously harming their gastrointestinal systems. "Though the asteroid certainly played a factor, the psychological deficit which rendered dinosaurs incapable of learning to refrain from eating certain plants had already placed a severe strain on the species," said study co-author Gordon Gallup, an evolutionary psychologist and professor at the University of Albany in New York. The theory that a single asteroid impact completely wiped out millions of years of evolution is the most widely accepted one and, according to Gallup, this new hypothesis is in direct contradiction to it. The poisons were being consumed by dinosaurs for several millennia as they gradually declined in numbers as flowers and fruits became available to them as a source of food. The last surviving dinosaurs — crocodilians and birds — have also been found to not have the ability to tell the difference between safe and unsafe food based on taste. Birds can identify poisons based on visual cues and completely avoid eating them.